Are you planning to launch your own website? Or have you already launched one? Taking your business online does gets a bit tricky, but it sure isn’t as difficult as it seems. And if we go by what Richard Benson, founder of Virgin Group, has to say “If somebody offers you an amazing opportunity but you are not sure you can do it, say yes-then learn how to do it later!“, then eventually it starts making sense! Now that you have taken/planned to take your business online, it’s time to get to know about your website in a better way. Here are explanations for few tech terms to clarify your basics about what is what when it comes to getting started with a website. It is your site’s address on internet. For instance if you wish to visit some place, you need the exact address of its location on planet Earth. Similarly, your website needs a location on the Internet. The domain name directs users to your website. All the domain names are registered with Domain Name System (DNS). Duplicate domain names do not exist. URL (Unique Resource Locator) gives the address to the elements of your website. For instance, if you need to direct a visitor to your living room then you will give them the directions to reach there like to the left or take a right and then a left. URL gives the address to particular web pages on a site. Example: https://webservicespoint.com/shared will take you to WSP’s Shared Hosting page while https://webservicespoint.com/wordpress-hosting will take you to the wordpress hosting page of WSP’s website. Internet is based on IP Addresses. 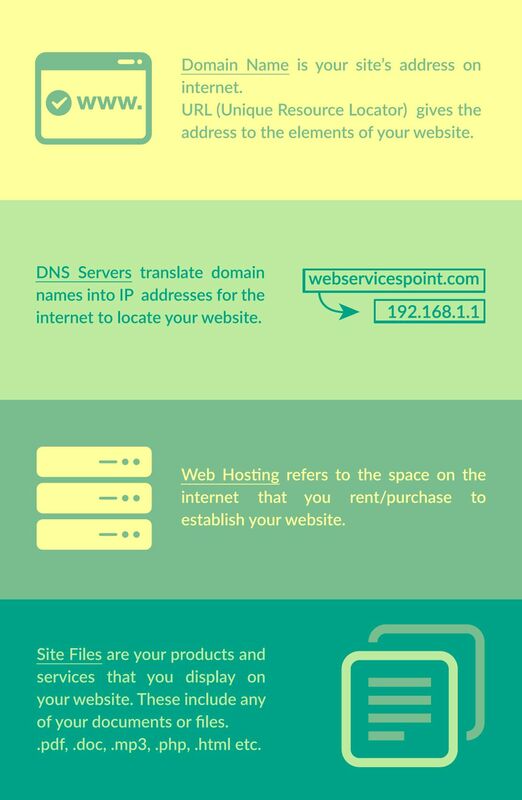 Therefore, DNS servers translate domain names into IP addresses for the internet to locate your website. It refers to the space on the internet that you rent/purchase to establish your website just like you need a portion of land to build your property on. Web hosting services are provided by web hosts that provide space on a server purchased/leased for use by clients along with Internet connectivity. For example, WSP is a web host. To conclude the idea behind these three terms, let’s take an example.